Wills are documents of distribution that become part of the public record when recorded. Counties typically archive them and make them available for public viewing. Wills are recorded to give general notice regarding the distribution of property and goods for individuals who have passed. Reading wills can shed light on historical events or give important information for family histories. Locate the office in the county where wills are filed. Many are in the county clerk's office, but often counties have special probate divisions, where probate records, or wills, are filed. Review the index for probate documents available from the clerk. The index will be either alphabetical or by date. Having the year and month of the death will help in finding the will. Court records are indexed in large binders, dated from the origin of the county until about 1990. After 1990, most records are available through a computer index. The clerk's offices should have computers available for public use to help locate documents. Very old documents may have to be viewed in their original forms. These will be located in large leather bound binders, filed by volume. This will be noted in the indexes. The paper will be very brittle, so the documents need to be treated gently. 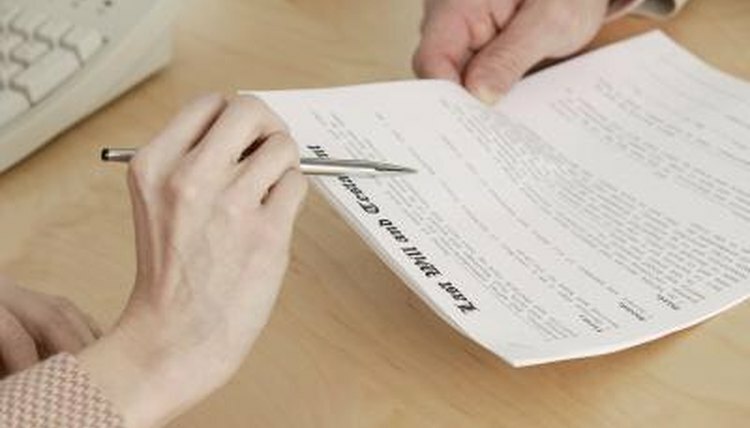 Copies of a will can be made, carefully using a copy machine, for review at a later time. How Can I Get a Copy of My Father's Will in Florida If It's of Public Record? View the probate records and will, either on the computer, from microfilm or in the original form. The recorded probate record will have copies of newspaper notices, rulings by the probate officer, the will, if there is one, and the final order by the judge. This order will spell out the disposition of the deceased person's estate. The will describes the belongings of the person, including all real goods and property. The heirs will clearly be named. The terms of the distribution of the goods and property will be listed. Property descriptions will be complete. Compensation for the executor will be included, if appropriate. Guardianship of all dependents under the age of 18 will be named. Any other miscellaneous wishes of the deceased will be included. Special circumstances and conditions will be denoted in the will. If the deceased died with no will, it is known as dieing intestate. If this occurs, the estate is probated by the judge and the judge will decree who will inherit all of the goods and property. The probate judge will make this decision after reviewing all records provided by the family. A final distribution order will be included, naming the heirs, and what they will receive, as per the judge's decision. Check on the deeds of all real property to see if the final filings with the heirs' names were recorded with the county. This is the final task to close probate and ensure the property changes hands smoothly. Robyn Nelson has been writing for 25 years, penning articles and ad copy for the motorcycle industry and articles about experiences in her professional career. She played college basketball and received a bachelor's degree in kinesiology from Cal State University at Bakersfield. Nelson has coached many sports and has written articles about team sports. Nelson, Robyn. "How to Read a Will in Public Records." , https://legalbeagle.com/5891198-read-public-records.html. Accessed 21 April 2019. What Information Does the Executor of an Estate Have to Give the Surviving Children?